Many of us see homeless people on the street, but don’t know who they are or what they face. When Bailey-Boushay House (BBH) learned a third of its 300 outpatient clients were homeless, they set out to understand why and how to help. BBH, a part of Virginia Mason, provides inpatient and outpatient care to people with HIV disease. BBH created a Housing Stability Project with a two-pronged approach. 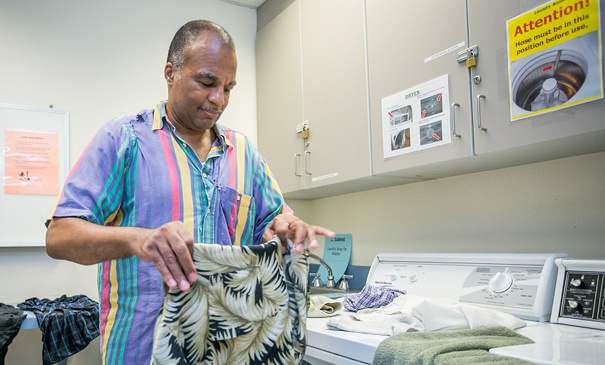 First, to meet homeless clients’ immediate needs, BBH provides washers, dryers and showers, gives foot care and free socks, offers a hot breakfast, lunch and a sack dinner, and sends out staff to help with hygiene and safety in clients’ environment. Secondly, BBH offers classes and staff support to build skills to obtain and maintain housing. These include conflict management, food safety, cleanliness, how to apply for housing and how to pay for it. BBH tracks their clients’ success in getting housing every day. “When there is a rain storm, I used to feel cozy in my home,” says Brian. “Now I worry about my homeless clients out in the rain.” With the help of BBH, and the Virginia Mason Foundation raising funds for support, there is hope that more and more people will be sheltered from the rain and have a home. Visit Bailey-Boushay House for more information on giving to BBH.